Today's Look: is all about bold, bright colors and bling! To celebrate a warm, beautiful spring day here in AZ, I chose to not wear boots. I always wear boots...but since the weather is finally decent I decided to wear my Conncords. I am obsessed with how gorgeous these shoes are. The shoes are definitely the statement piece of the outfit, so I went with a simple off-white blouse and light blue jeans. I rolled up the pant legs of the jeans to make them more seasonal appropriate. To tie everything together, I wore a pink purse that matched the pink in the shoes. 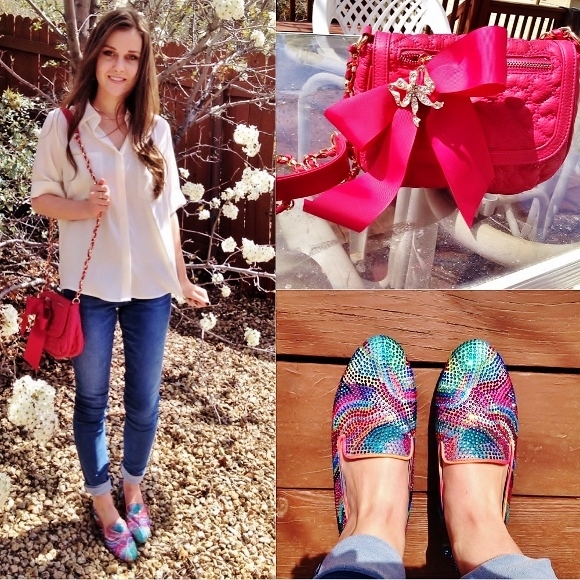 Outfit Details: Shirt by Express, Jeans by Express, Shoes by Steve Madden, Purse by Betsey Johnson. Fashion Tip: After winter has finally gone and spring has arrived, the trend always seems to be ankle pants. Don't waste your money by buying pants that are flood ready. Instead, just roll your skinny jeans up a couple inches and voila`! You're spring ready.